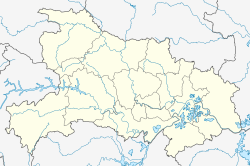 Shayang (Chinese: 沙洋; pinyin: Shāyáng) is a county of west-central Hubei province, People's Republic of China. Administratively, it is part of the prefecture-level city of Jingmen. The county is located south of the Jingmen city proper, west of the Han River, and north of the Chang Lake (Chang Hu). The county seat is a town of the same name (Chinese: 沙洋镇, Shayang Zhen), situated near the Han River, which eventually flows into the Yangtze River. To the east of the town is a huge flat region which contains one of the largest prison farm systems in China (沙洋监狱管理局). A major provincial highway runs right through the middle of the prison region, and through the massive cotton fields that are tended by convict teams who march to and from the fields and the prisons on special paths separated from the highway by ditches. This page was last edited on 17 December 2018, at 04:30 (UTC).